FOR IMMEDIATE RELEASE—June 12, 2012– Binghamton, New York–SunMaxx Solar, a leading integrated manufacturer of solar thermal systems and components is pleased to announce that the SRCC (Solar Rating Certification Corporation) has completed testing of the company’s new SunMaxx TitanPower and TitanPower Plus brand private labeled glazed flat-plate collectors which have received certification on the AA3 models. The SRCC found the 4×8 TitanPower collectors to be the second most efficient on the market, with 36.5 K BTU per day under SCRR “C” conditions. The TitanPower AA3 and TitanPower Plus AA3 collectors are manufactured using noble materials and offer an unmatched level of efficiency using a copper tube and aluminum absorber design. The new certifications continue to ensure SunMaxx customers that their solar investments will achieve the highest thermal efficiency and thermal stability, which will complete any residential or commercial application. SunMaxx is a leader in renewable energy manufacturing and distribution, offering many SRCC certified system options in the U.S. and abroad. SunMaxx Solar will continue to develop and help procure the installation of solar thermal systems across the nation, and is proud that the company’s products greatly contribute to reducing the nations carbon footprint. In today’s energy consuming world, SunMaxx offers world-class renewable products, and strive to meet the increasing need for alternative energy sources. 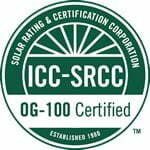 For a complete listing of SRCC certified SunMaxx Solar products please visit www.sunmaxxsolar.com. For more information email marketing@sunmaxxsolar.com.